Read the Latest Issue of Phytopathology News! 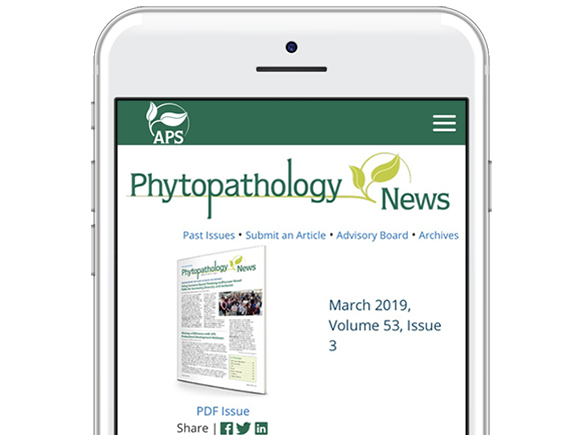 With the launch of the new APS website, Phytopathology News also got a new look! Phytopathology News is now compatible with all your devices. Check out the new format and submit your photos, audio, and video multimedia for publication! Swisher Grimm and Garczynski studied potato tubers from the Klamath Basin in Oregon and discovered a new haplotype of ‘Candidatus Liberibacter solanacearum,’ the bacterium that causes symptoms of zebra chip disease and can be economically devastating to potatoes in the United States. Karmakar and colleagues present a careful, temporal analysis of the peanut nodule transcriptome. The highlight is the comparison of expression of known symbiotic genes in other legumes with those in Arachis hypogaea. This important transcriptomic resource provides insight into the evolution of symbiotic nodule development and rhizobial infection via crack entry. Registration is now open for Plant Health 2019. Advance Rate & Registration PLUS are also available. The meeting runs from 10 a.m. on Sunday, August 4 to 12 p.m. on Wednesday, August 7. The APS Graduate Student Committee is proud to bring you the 2019 Art in Phytopathology contest. Plan to Get Inspired by POD Talks at Plant Health 2019! Support a good cause: Donate items to the OIP Silent Auction! Participate in the APS Member Survey. Check your inbox for an email from ReadEx Research. Your response is vital! PDMR’s second submission period opens April 10! Submissions are easier than ever. Phytopathology “Fusarium Wilt of Banana” review referenced in a Newsweek opinion piece. New plant disease lesson, “Frogeye Leaf Spot of Soybean,” available through the Education Center. The APS News Capsule is a benefit of your APS membership. "APS membership helps me, as well as my colleagues from the Department for Plant and Environmental Protection, to be informed about all the news that happens in the field of plant protection from a scientific point of view and to connect with colleagues all over the world who work on the same topic."